Catholic Bible 101 - Who Started Your Church? The Catholic Church -33 AD. Founded by God in the person of Jesus Christ. Our Lord named Peter the future leader of His Church, when He said to him "Thou art Peter (Rock), and upon this rock I will build MY Church. 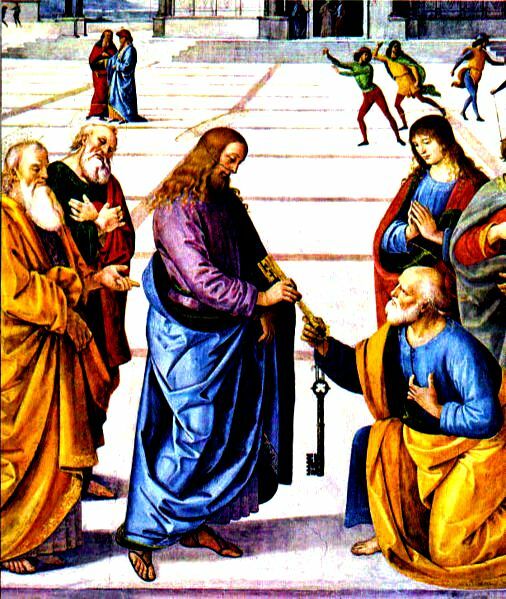 I will give you the keys of the kingdom of heaven.." (Matthew 16:19). The Lutheran church –1517 AD. Founded by a man, Martin Luther, an ex-monk of the Roman Catholic Church, who violated his sacred vows of both obedience and celibacy. Luther created a brand new protestant bible by throwing out 7 books of the bible he personally didn't agree with, and added the word "alone" after the word "faith", in Romans 3:28, in order to make the verse agree with his view of what it should have said (faith alone). This alteration of sacred scripture directly contradicts James 2:24. Luther also called the Catholic Church "the whore of Babylon", and he said that the Pope was the antichrist (someone who denies that Jesus is God). The Anabaptist church – 1520 AD. Founded by a man, Nicholas Storch, and Thomas Münzer, former Lutherans. The Anabaptists rejected infant baptism and were denounced by Martin Luther. This "reformation of the reformation" is proof positive that the doctrine of "scripture alone" is false. Otherwise, there wouldn't have been more than one interpretation of scripture and no need for an anabaptist church that totally ignores Luke 18:15-17. The Mennonite church – 1525 AD. Founded by men, Grebel, Mantz, and Blaurock, in Switzerland, as an offshoot of the Anabaptists. It derived its name from Menno Simons, a former Catholic priest. The Baptist church – 1606 AD. Founded by a man, John Smyth, who launched it in Amsterdam, as an offshoot of the Mennonites. Baptists reject infant baptism as contrary to the Scriptures, and accept immersion as the sole valid mode of baptism. The Amish church – 1693 AD. Founded by a man, Jacob Amman, a Swiss Bishop. Also a breakaway from the Mennonite church. His followers were called the "Amish." While similar to the Mennonites, they differ in language, dress, and interpretation of the Bible. The Anglican Church – 1534 AD. Founded by a man, King Henry VIII, as a direct result of the Pope not granting him a divorce from Catherine of Aragon. Many a Catholic priest was tortured and killed as a result of the very aroused Henry trying to find another young maiden for his pleasure. The Queen of England is the current head of the Anglican Church. The Congregationalist church (The Puritans) – 1583 AD. Founded by a man, Robert Brown, in Holland. Broke away from the Church of England. Brown rejected, among other things, the authority of bishops. One Puritan, named Oliver Cromwell, got involved in the English Civil War, and overthrew Charles I in 1646. Cromwell and the British government were also responsible for the subjugation and killing of hundreds of thousands of Irish Catholics, who were also forbidden to say Mass, wear green, and sing patriotic songs. The Unitarian church – 1568 AD. Started in Poland, but died out. It was soon replaced by a man, John Biddle, in 1645 AD. The Unitarians do not believe in the Trinitarian God. The Episcopalian church – 1784 AD. Founded by a man, Samuel Seabury in the American Colonies & is an offshoot of the Church of England. They believe in women priests and bishops, artificial birth control, and they accept homosexuality as being normal and good in spite of Romans 1:26-27. The Episcopalian Church is currently undergoing a 21rst Century reformation of itself, with individual congregations breaking away from their own hierarchy over the question of scriptural inerrancy concerning homosexuality. Another proof that the doctrine of "scripture alone" without an infallible Magesterium to interpret it based on sacred Tradition is false. It seems that the Episcopal Church is more concerned with going along with the current trend of society than it is in being true to what scripture actually says about homosexuality. The Quakers - 1647 AD. Founded by a man, George Fox, in England. Also called The Society of Friends, although they originally called themselves "Children of Light". They acknowledge absolutely no authority higher than what Fox called the "inner light" of personal revelation. The Methodist church – 1739 AD. Founded by men, John and Charles Wesley, in England. The Wesley brothers were originally Anglican ministers who started a revival movement that eventually became Methodism. Yet another reformation of the reformation. The Evangelical church – 1803 AD. Founded by a man, Jacob Albright, originally a Methodist, who broke away and founded his own church. The Mormon church – 1829 AD. Also call themselves "Latter Day Saints", was founded by a man, Joseph Smith in Palmyra, New York, in 1829. They are polythesists who someday hope to become a god of their own planet. after death. They believe that God the Father was a good mormon on another planet and was so great that he became the god of our planet. They also believe that Jesus and lucifer were brothers on that former planet. The Seventh Day Adventists – 1831 AD. Founded by a man, William Miller in New York. Based on his study of the prophecy of Daniel 8:14, Miller calculated that Jesus would return to earth sometime between 1843 and 1844. This prediction is in spite of the fact that the bible says that no one will be able to predict when the Second Coming of Jesus will be (Matthew 24:36). Jehovah's Witnesses – 1872 AD. Founded by a man, Charles Taze Russell, as the "Millennial Dawnists." In 1931, Judge Rutherford, his successor, decided that henceforth they would be called, Witnesses of Jehovah, or Jehovah's Witness. The JWs deny the divinity of Christ, the resurrection of the body, and refuse to take blood transfusions. The Christian Scientists – 1879 AD. Founded by a woman, Mary Baker Eddy in Massachusetts. They also refuse blood transfusions and medical care, in spite of the fact that the gospel writer Luke was a physician. Assemblies of God - 1901 AD. Founded by a man, Charles Parham, in Topeka Kansas. They believe in the Baptism of the Spirit, miracle healings, and speaking in tongues.